Two Side. One Story. Draw the Forgotten War. Explore an ancient world through storytelling! 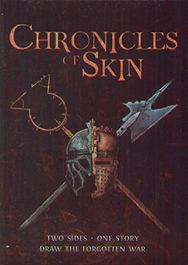 Chronicles of Skin is a complete, full-colour card game that turns players into storytellers. Using custom cards and a pencil, players work together to discover the story of an ancient war. Doodle, invent cultures and explore a world far apart from your everyday norm.